In 1991, flight attendant Nancy Ludwig checked in to an airport hotel near Detroit. The next morning she was found gagged, raped, and tortured-her throat slit with such rage that she was nearly decapitated. Her husband Arthur never gave up hope that the future would bring enough evidence to close the case. But it was the past that held the clue. In 1985, fifty-five-year old Margarette Eby, a music professor, met the same grisly death at her cottage in Flint, Michigan. The case went cold-until six years later when the victim's son Mark came upon the story of Nancy Ludwig's slaying. With nothing to go on but intuition, he called authorities, certain that the same fiend committed both crimes. A cunning sting operation yielded irrefutable DNA evidence, and authorities were led to the home of respected navy veteran Jeffrey Gorton living quietly with his wife and two children. But his cold-blooded secrets were only beginning to come to light, leaving fears that there were more victims yet to be found in a killing spree that had finally come to an end. 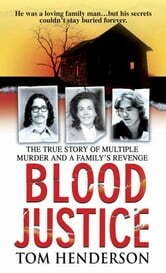 Blood Justice shows veteran reporter and author Tom Henderson at the top of his game.